55 nonstop destinations, lower average fares, and 9 airlines—Myrtle Beach International Airport is your gateway to the world. Your next adventure, business trip, or family get away starts here. When you're here, the beach is your playground with over 60 miles of sand, sun, and the sparkling Atlantic Ocean. And while a trip to our beach is a must when visiting the Myrtle Beach area, the fun extends beyond our shores to thousands of area activities and attractions. Take some of the stress out of your travel by preparing for TSA screening before you get to the airport. TSA suggests arriving 90 minutes to 2 hours prior to your scheduled departure. Myrtle Beach International Airport offers a variety of options in dining, shopping, and activities for travelers on the go. FOOD & DININGWhatever your preference, Myrtle Beach International has something for you. Try something spicy at Nacho Hippo or the classic at Chick-fil-A. If you're in the market for an in-flight magazine or need a device charger you may have forgotten to pack, one of the vendors at MYR has it. Waiting at the airport doesn't have to be a drag - try an airport scavenger hunt, start a travel bucket list, or get your steps in while you wait. Enjoy free high speed WiFi throughout the entire airport to stay connected with work or family, surf the web, or stream a movie before your flight. Parking options continue to expand at Myrtle Beach International Airport, and we now offer several convenient parking options with easy transportation to our terminal. For the ultimate convenience, we now offer Curbside Valet parking from just outside the Terminal entrance. Handicap spaces are available in each parking lot. Travelers with valid placards or license plates are afforded one 24-hour period of free parking in long or short term parking. The assignee of the placard or license plate must be present upon leaving the parking facility to qualify for free parking. A quick walk for drop off and pick up. Airlines recommend that you arrive up to two hours prior to your departure to check in and drop any checked bags. Find your way around Myrtle Beach International Airport and prepare for another exciting takeoff. Superior Aircraft Services is available for curbside baggage assistance to and from the Terminal Building. MYR strives to provide an excellent passenger experience to all travelers; for assistance just ask! The ticketing counters at MYR are located inside the Terminal Building and are your stop for all airline info. Self-service kiosks in the Terminal Building allow travelers to check in and print boarding materials. Find your way out of Myrtle Beach International Airport and into our little slice of paradise, with beaches, shopping, and activities galore. On the first floor of the Terminal Building, Baggage Claim is your last stop before sunshine. For those international travelers, U.S. Customs and Border Protection will aid in your entry to the country. If you have a moment to spare, MYR has the food you've been craving, from a burrito to a burger. Find your loved ones parked in the Short Term lot or give them a ring to come from the Cell Phone lot. Flying to Myrtle Beach International Airport is just the beginning of your journey. From here, take a rental car, rideshare, taxi, limo, or public transit to experience the Grand Strand. The counter in the Rental Car Center is open late, with 8 national brands to get you on the road. Hop off the plane and into a taxi waiting outside of the Terminal Building at Door 6. Meet your rideshare driver outside of the Terminal Building on the outer pickup lane. Public buses that run from Myrtle Beach to Georgetown and Conway make stops until 8 p.m. at MYR. At Myrtle Beach International Airport, we strive to provide the best in the passenger experience. In our Terminal Building, you will find services, information, and staff ready and willing to serve your travel needs. 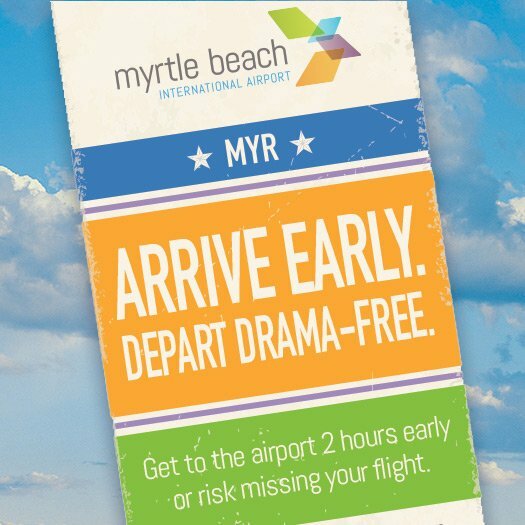 Picking someone up from the airport is easy at the Myrtle Beach International Airport. Here are a few tips to get you in and out in a flash so you can get back to enjoying the beauty of the Grand Strand. Myrtle Beach International Airport has a variety of options to make picking up friends, loved ones, or business associates easy. A free lot for drivers to park and await a phone call from passengers for curbside pickup. For those wishing to park and take a short walk to the Terminal Building, the first 15 minutes are free. Valet parking is available from the drop off area at the curb of the Terminal Building. Myrtle Beach International Airport is centrally located on the Grand Strand. Meeting your friends and loved ones at Myrtle Beach International Airport is a fun experience. Under airport rules, curbside waiting is not allowed and is only to be used for active loading of luggage. Inside the Terminal Building, visitors may meet passengers on the first floor near Baggage Claim. International passengers will exit the Terminal Building from Customs beside the MYR sign. Baggage Claim at Myrtle Beach International Airport is on the first floor of the Terminal Building. Grab a quick bite at Boardwalk Cafe, located on the first floor of the Terminal Building. Simplify your vacation or business travel by flying directly to Orlando on Spirit Airline's new twice weekly service. Or take a flight to any of Spirit's 21 other non-stop destinations from Myrtle Beach International Airport.